When choosing art supplies for kids, don’t forget the paper! Paper for children can be anything from a sketchbook or a stack of colored construction paper to a roll of easel paper or fancy decorative papers. Quality varies widely as does price. So how do you decide what paper to buy? When choosing paper for children and their art activities, you’ll want to consider what art materials the kids will be using with the paper as well as value (which I define as a good intersection of quality and price). We use this “Ultimate Art Paper” the most for our drawing, painting, and collage projects. It’s our general all-purpose kids art paper. I keep a stack of this in the studio and also have a basket of it near the dining table. If you’re only going to get one kind of paper, this is the kind I would suggest (or something similar). We also like and use this heavyweight (80 lb) white sulphite paper for all-around use. I also often purchase large sheets of poster board from Target for 39 cents each. Sometimes I cut them down to smaller pieces and sometimes I keep them whole. I love letting Maia work large, and this is a cheap way to provide this size (2 x 3 feet). For a free option, you ask a mat and frame shop to save their mat remnants for you. They are thick and great for painting or collage. We use these quite a bit! You can also re-use paper grocery bags (just cut them open) and cardboard for art. from Discount School Supply, the Strathmore 300 Series watercolor paper, or the Strathmore Kids paint pad. All are decent quality for a decent price. You can also use any paint (like tempera) on watercolor paper, and we do, but it’s more expensive than other paper so you might not want to. We also paint with watercolors on poster board and mat board. Note: If your kids are really into watercolor painting and you have the budget, try out some of the better quality watercolor papers. You get what you pay for with watercolor paper. offered by Discount School Supply the best so far of the ones I’ve tried. The paper is sturdy enough to paint on, unlike the easel paper from Melissa & Doug, which I think is on the flimsy side. The paper roll from IKEA is pretty good, too. We buy this brown contractor’s paper at Lowes for about $10 a roll. It’s super economical! We use this for big projects such as body tracing or when we want to cover the table with paper and have a family draw fest.
. We finally bought some and really love it—our roll is lasting for a long time, which is a bonus. Whether your kids like to work small, draw small, paint small, or whether you just want to change things up for them and offer a variety of paper sizes for art, then have small paper available. This can simply mean you cut regular-sized paper down into smaller pieces—totally acceptable!—or you buy a pack of blank index cards as I often do. It can mean using Post-It notes for art, finding a mini sketchbook, or getting an inexpensive multi-colored notepad. Besides the basket of white sulfite paper mentioned above, which travels all over our house, I also keep inexpensive spiral bound sketchbooks at the kids art table, in their bedroom, and in the car. I pay about $2-3 per sketchbook (at Target or the drugstore) and then don’t worry when the children use it for all sorts of drawing, writing, cutting, and taping projects. We also buy the beautiful sketchbooks from Stubby Pencil Studio—more money, but lovely and high quality—and the art journal kits from Artterro. The kids usually get one of these for their birthdays and Christmas. —it is very inexpensive yet the color and paper quality is much better. The colored paper that IKEA sells is also good. is a great, albeit more expensive, surface for kids art. Plus it looks great on the wall or shelf as is—no frame required. I LOVE Susan’s idea of keeping a collage box of bits and pieces of interesting papers! I’ve been keeping a stack of papers and cardboard that was destined for the recycle bin, but Susan’s collage box takes that idea to a whole new level. Also, you can re-use paper grocery bags (either cut them open or use as is), cardboard, and, as I said above, mat remnants from a frame shop. quite a bit, often for various stained glass projects. One paper that we don’t use is newsprint. I can’t stand the stuff! It’s so flimsy. How about you? What papers do you use the most in your house for children’s art? We buy packs of watercolor paper for a really reasonable price at our local school supply store and it is our favorite for paint and oil pastels. But we have the same problem of going through paper faster than oxygen. I finally started buying composition notebooks at back to school sales (25 cents each). This way my daughter always has her “sketcher” book. When one is full we start a new one. We even made a fabric cover for it to make it more personal. I don’t love art on lined paper, but it is cheap and my daughter doesn’t seem to mind for those times when she just wants to draw letters and shapes with her markers. It probably wouldn’t work for an older child who would be bugged by the lines though (my daughter is only 3). We also have a collection bucket in the garage (that drives my husband CRAZY) but we throw in cereal boxes, paper towel rolls, paper scraps, etc. We’ve recently had to add a fabric scrap bucket because right now that is the favorite collage medium around here. I think our next purchase will be the brown paper rolls from the home improvement store. really like the tip about the lowe’s paper. economical, indeed! Just in time!! I am running out of easel paper and water color paper and was contemplating from where I must order. We bought the newsprint from Discount School Supply (500 sheets)! We also use computer print paper all the time, as well as construction paper. I love the contractor’s paper at Lowe’s idea—we’ll pick some up when we go there for Build and Grow (build wood toys for free some Saturdays if you don’t already know). They seem PERFECT for body drawing!! How awesome! I also love the sulfite paper idea. i will also try checking out frame stores for scraps! That’s amazing, but sounds a little like too good of a thing for a person living in the LA area. Ooh, thanks for the recommendation on easel paper. We’ve been using the Melissa and Doug and every time I try to unwind a piece, I get so mad because it is SO hard to pull through. It just rips and keeps ripping down the middle. Wow this is finally a great post about art. Art just appears on whatever we choose to create it. Great post, congratulations. I am painting through synesthesia which makes me see colors when I hear names and numbers. These colors I transform in paintings. Colors are my life. Thank you so much for the mentions of Discount School Supply paper and art materials! It’s so fun to see our products out there in the real world getting used in wonderful, creative and open-ended ways. Thanks for sharing your great ideas, and for including our materials in the fun! We use a lot of what you mentioned. I also save every bit of thin cardboard from packaging. We have a drawerful, in all shapes and sizes, and it’s a very popular paper source in our house. Wow its a nice advice i like it my child like to painting. So its a informative post for me. Thank you so much for this list! I am always trying to figure out the best paper to get for various art projects and this is a huge help! Thanks for sharing your paper resources! What a great list…my shopping cart is already starting to fill up. We use a lot of the $5 rolls of easel paper from Ikea for sidewalk-style drawing and floor drawing. You can’t beat the price, especially if Ikea is less than 5 miles from home. And I agree with you: newsprint is horrible, and we rarely use construction paper. Why do materials designed for kids have to be so terrible? Related to Susan’s collage box, I also save and chop wrapping paper scraps…they’re often beautiful and the images are so varied. Thank you so much for this post and for your response to my earlier email. I just bought a pack of sulphite paper. We have been doing more art this summer, so much so that my son says excitedly, “Let’s do an art project!” He’s even thinking of his own. The other day, after we finished eating pistachios, he wanted to make a collage out of them. I borrowed “Nature’s Art Box” from the library, which has great activities. We tried to make the cornhusk hat, but the husk kept curling up. And yesterday, in the car, he asked to draw–he’s never asked that before! I’m so thankful to you for helping me bring interesting and creative art ideas to our home. We get the end rolls of newsprint from our local newspaper. 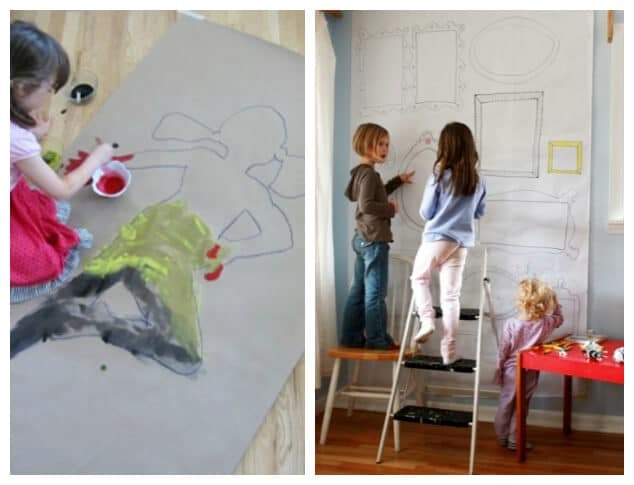 They’re great for covering walls and floors for drawing fun. I adore paper! We have all sorts in the house, in boxes and bags and pads. Right from when the kids were first able to pick up a crayon I wanted them to always have clean new paper to work with – so we have used photocopy paper as the always available paper for them to grab and draw on. The children have spent many many hours drawing over the years and the artworks are easy to store in the boxes the reams of paper come in. If we want to paint I will use better paper – but for pencil and felt drawing this has been a brilliant economical paper. I love the range of papers you use, and the your recommended uses for each. I ditto everything you’ve said here but also want to add one… The giant lawn and leaf bags that we always have extras lingering around in the winter… they’re usually 2-ply and if you cut open the sides, nearly the size of two toddler bodies! We buy ours from the hardware store when it’s leaf bagging time, but I know some area communities have free bags just like these available (just depends where you live I think). This may be too messy of a suggestion but what we were doing for the longest time is making our own paper. Take any newsprint, old drawings, ads, or leftover office paper and tear it up (the kids like doing this). Put it in your blender or food processor (even the hand spin ones work), add water and create a slurry. Get an old screen and staple to a wooden frame (or use an old window screen) and pour in the slurry over top of a catch basin. You can also just dip a small screen in a bin of the slurry, move it around and lift out. Leave this to drip dry and once done pull off of the screen. You can make this as complicated as you want, playing with dyes, flours, different papers, ect. If you don’t want grey paper you will have to be careful of your paper source. At any rate this is what we used for craft paper in our house. I didn’t read all the comments, however, if you have a book printing company in your area, many of them will give away the end rolls they have for free. We call the company in our area and go pick up as many roll at a time as we want. The rolls are large butcher paper rolls. 3-4 rolls will last our daycare a year or more. Okay, on your body tracing illustration the paper is white but you say you are using contractor’s paper from Lowe’s which is brown. In the picture are you actually using the easel paper? I find it only 18″ wide. I love all your craft and painting ideas. As a children’s librarian, I am going to use quite a few this year during pre-school StoryTime. I actually bought the contractor paper and used it as dirt for our Summer Reading Program this summer. Wonderful texture!!!! I just bought a roll of butcher paper at Costco and miraculously it fits in our paper dispenser from IKEA. The paper seems to do the trick for the few things we’ve used it for like crayons and poster paints. The paper seems to have a coating on it, but doesn’t seem to interfere with anything so far. Do you have any experience with butcher paper?